A rather nice week ahead for me, a few frantic design days in the studio and then a buying trip to Paris which I am hugely excited about. Having been so poorly last week the thought of having time at home (no alarms going off at 3.30 am) and some good food is heavenly! Last week I did something for the first time, striped a wall for a client, and I have to say although dubious at first it totally and utterly worked. 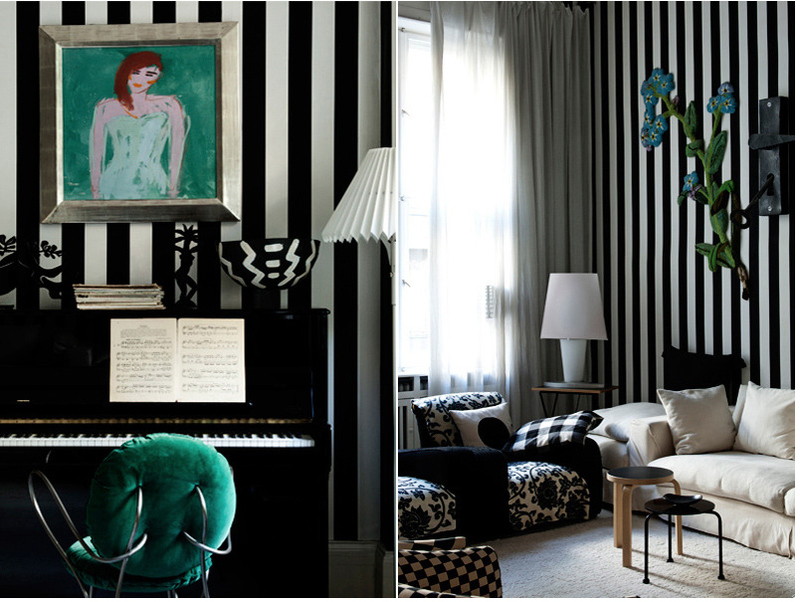 I’m not actually sure why I’ve steered away from stripes as they enliven a room instantly. You can go thick, thin, vertical or hortizontal. They can add a sophisticated vibe (think tone on tine) or a playful vibe (think whole host of hues). Stripes are so versatileÂ and they are not as hard to pull off as feared I promise you. They add instant energy and drama to a space to fab for kids rooms, hallways, home offices. Top tip painters tape is the thing to use when painting stripes, zap a credit card along the tape for a tighter seal and the paint won’t seep through. Check out the beautiful images below (by www.brothertonlock.com).